Window seats add additional out-of-the-way seating that is integrated with the overall look of your room. As a seating solution, a window seat can also work to showcase a dramatic window treatment, like a bay window, or balance other nearby fixtures, like shelves or bolsters. Window seat plans come in many styles and can be custom designed to fit almost any window or room. If you have limited carpentry skills, you can still build a window seat or bench - complete with storage - by using 15-inch tall kitchen cabinets as the base. This a great option for those that want to create a "banquette" style seat, as well as for those that want some storage, or that want a look that will tie in with the rest of the home. Kitchen cabinets come in all colors and styles, so it's easy to find a set that will complement the rest of the house. Plans include material lists, tools and instructions for modifying the cabinets to fit the size of your space. Download and print the plans by clicking on the image to get started. 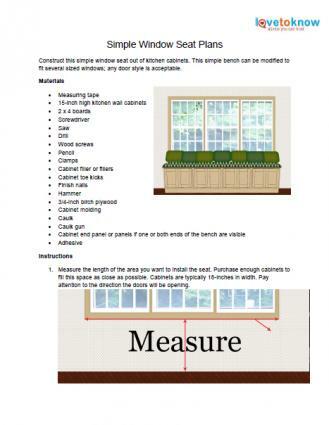 Download these simple window seat plans. 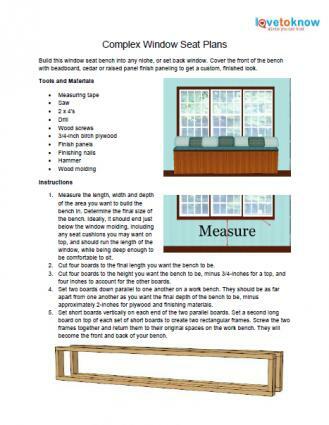 If you're more experienced at carpentry, and have completed some woodworking projects before, consider taking on this set of window seat plans. These plans are designed to be built into a window niche, or an area in front of a bumped-out window. Finish the front of the seat with any type of paneling, from beadboard to give the seat a cottage feel, to raised panels made by a kitchen cabinet maker. Cedar, such as what is used to line chests, also makes a nice choice for finishing the seat. Plans include material lists, tools and instructions to build a window seat inside any sized window niche. Download and print the plans by clicking on the image. Download these complex window seat plans. 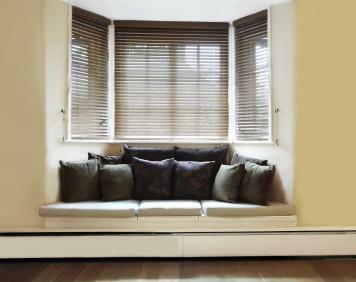 Building your own window seat is a great way to add a custom touch to any room of the house. Just remember to remove any sills or molding currently on the wall near the window to get the best fit. Whether you're new to carpentry, or you've been building for years, build yourself a window seat and cozy up to some new home style.